It occurs to me as I make this list that Thanksgiving to me is really about 3 things: turkey, dressing, and dessert. Well, and being thankful and all that. So, this is not exactly a well-rounded list of Thanksgiving ideas, but I hope you like it. 1. These little pilgrims were the very first post on Bake at 350...FIVE years ago! 2. If you're family is into math, or corny puns, how about making them some pumpkin PI (cookies)? 3. These little turkeys are made from a flower cookie cutter, and they just make me happy. They would be really fun to make with the kiddos while they're home this week. 4. Let's talk turkey (literally): our family always has a smoked turkey, but these two...one mayonnaise roasted, one beer can with bacon...have me wanting to make a second one. Mayonnaise? Bacon? *sigh* I love food. 5. OK, so now that we've discussed the main dish, let's get back to dessert, shall we? How about Pumpkin Cheesecake CAKE?!? 6. Or maybe...Caramel Pie? Not Caramel Apple Pie, just caramel pie. Have I mentioned Robyn is a genius? 7. It's me...being bossy again. But, you guys...this *really* should be on your dessert table. 8. Sweet Potato Pie: think you like pumpkin pie? You haven't tried sweet potato. It's time. 9. Need a crust for those pies? This is my go-to. 10. This little pie cookie is in my book. I love it...a pie COOKIE. Anyway, Kami made these aDORable free printable little cards to go with them. They'd be so cute as placecards! 11. Last but not least, turkey cake pops. Thanksgiving really doesn't get any cuter than this. As we head into Thanksgiving week, I wish you all short check-out lines at the grocery store, a parking space by the cart return, and venti Starbucks to get you through the planning/shopping/prepping/cooking. Mmmm...sweet potato pie...my favorite, and the picture makes me want some NOW! What a lovely collection of goodies! Happy Thanksgiving to you and yours Bridget! Your pumpkin pie cookies are one of my favorites!! Oh the parking spaces . . . already they are hard to find! Awesome cookies. :) Happy Thanksgiving! I seriouslyhad to take a double take at your pumpkin pie cookie! Iy loos so real! Love that pie cookie. I bought your book and have been loving using your recipes and tips. I had a few friends over last Friday for decorating. We had a very good time! i literally gasped at that pumpkin pie cookie! how adorable! have a happy thanksgiving!!! Omg--that pie cookie is amazing! Seriously... the pie cookie... way more creativity in one cookie than I'll have in a lifetime! Adorable! Those pumpkin pie cookies that look like pie really do it for me. Love that cookie pie! So cute! haha! I love that pie cookie! Happy Thanksgiving, friend! That pie cookie is the cutest little thing ever! you are welcome in my blog !! You forgot to wish us a pair of big elastic pants! My daughter IS bringing an apple-cranberry pie to dinner, and I am still determined to get your ADORABLE pie cookies done:) Happy Thanksgiving and Happy 5th blog anniversary~WOW!!! Looks delicious ! Love your pictures, how colourful, guess it must have been a perfect dinner !even though what I really wanted to do was eat it with a spoon. 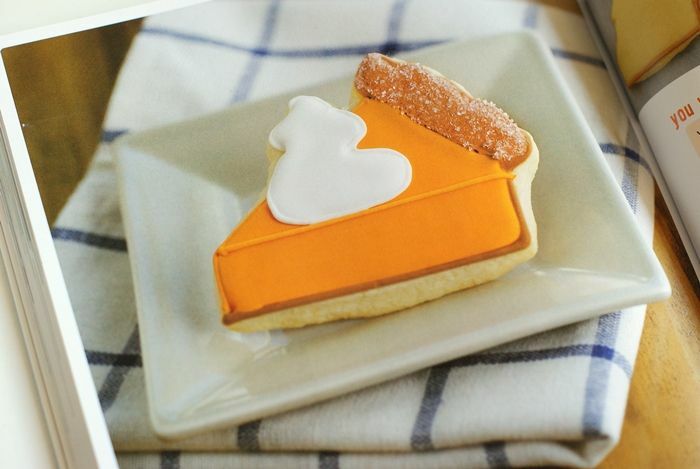 Your pumpkin pie cookies are the cutest! 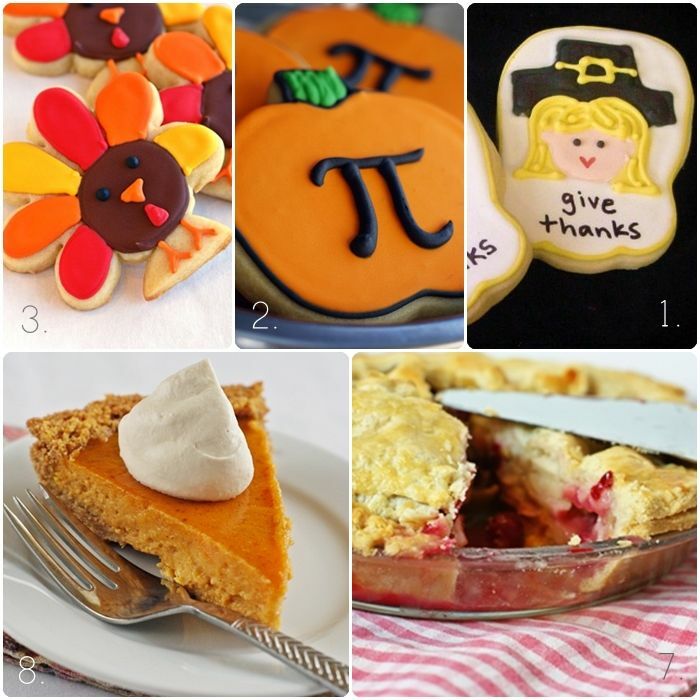 Thanks for the shout out about the pumpkin pie printables! You are the sweetest!